It’s crypto winter. Cryptocurrencies have crashed by as much as 90%. Startups have shuttered. But in the background beyond the headlines are positive indicators. Three examples: Tokenized fundraising continued to evolve, the largest digital currency asset manager in the world found investors cautious but patient and the largest US bank announced its very own blockchain-based token — the most recent evidence of long-standing enterprise involvement and the maturing of a nascent technology. ICOs offering money for nothing — albeit as cryptocurrency — couldn’t last forever, and they didn’t. ICO’s hit reality in 2018 — including investor resistance and SEC scrutiny. Both cryptocurrencies and ICOs plummeted — cryptocurrencies in value, ICO’s in number and funding raised. Increasingly few exchange listings exacerbated the declining appeal of the ICO by killing investor liquidity. 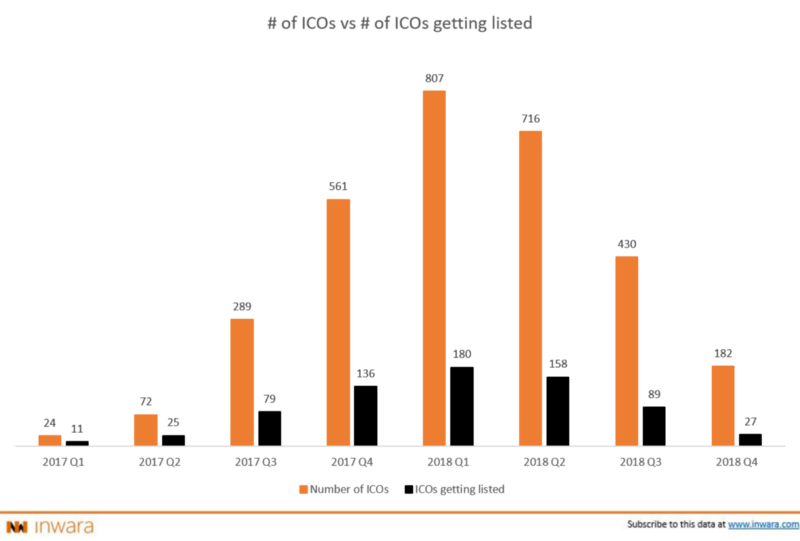 From January to December 2018, the amount ICOs raised collapsed from $1.5 billion to $74.5 million (ICO Data), the number of ICOs from 807 at the end of Q1 — the all-time monthly high — to 182 in Q4, and exchange listings from 180 in Q1 in 27 (Inwara). But tokenized fundraising may well be in transition and likely to survive. ICO problems stemmed from the nature of the cryptocurrency tokens investors received. Their lack of intrinsic value and dependence on user perceptions resulted in massive speculation and fraud; their lack of compatibility with US securities laws from the 1930s led to major legal and regulatory uncertainties. During 2018, the STO (Security Token Offering) emerged as an alternative. For these, investors receive tokens backed by a tangible asset, such as equity in a company or real estate. STOs also have protections in place for investors. Most currently being initiated are private placement securities offerings to accredited investors. This, sadly, eliminates sales to the general public, though the SEC has a backlog of exempt public security offerings, or Regulation A+ STOs, currently awaiting approval. Securities attorneys are working on a number of additional problems and the SEC is expected to issue “plain English” guidance on the security token analysis as soon as early this year. In addition, bipartisan legislation, the Token Taxonomy Act, was introduced to Congress in December. Its major goal is to clarify “that securities laws do not apply to companies that use blockchain once they reach their goal of becoming a functional network.” Interesting! It’s not a slam dunk, but there’s hope for positive change. A reason to want tokenized fundraising is its ability to create value for innovating entrepreneurs, innovative investors and the businesses their tokens support. · It represents a new road to rapid liquidity for investors. · It can allow companies to engage with potential customers as token buyers. · And it can create a new kind of participation in building success for a business, with incentives increasingly mutual, thanks to a token-based network effect. Grayscale Investments, the world’s largest digital asset manager, creates investment products based on virtual currencies, targeted at both institutional and retail investors. Despite everything, the company had a bumper 2018, with $359.5 million in inflows, the strongest calendar year inflows in the company’s history. The bear market caused the company’s weekly average for investment inflows to shrink in Q4 from $6.9 million to $2.3 million. 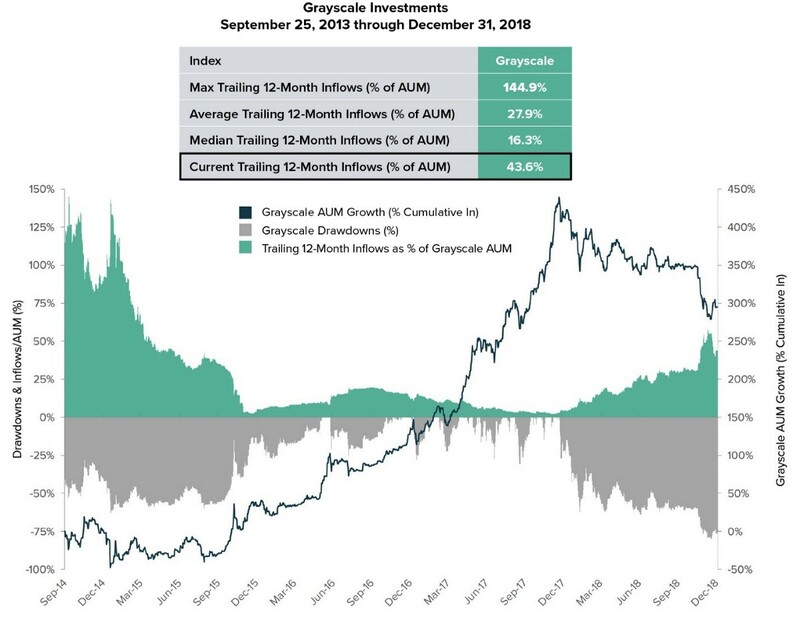 But the company still had $825 million in assets under management (AUM) at year end, with 44% from 2018 investment inflows — this despite the highest drawdowns on AUM since the last bear cycle in 2015, spiking at 75% in December. An encouraging trend was the increase in the volume of funds coming from retirement funds, which were up 40% in the final quarter. Institutional investors still represent the largest share of inflows. The bank is JPMorgan Chase, the token is called JPM Coin, and it isn’t money per se. It’s a digital coin that represents US dollars already held in JPMorgan Chase accounts. The purpose is to reduce cost, capital reserves and risk for institutional clients making payments to other clients. When one client sends money to another using blockchain, the settlement time is eliminated because their JPM Coins are transferred and redeemed for the equivalent US dollars instantaneously . Initially, the JPM Coin will be issued on the bank’s Quorum blockchain and subsequently extended to any standard blockchain network. The coin is currently a prototype that has tested successfully for payments and will be rolled out in a pilot program later this year. The bank plans to explore other use cases for the technology, such as custody and clearing & settlement. There’s more here than meets the eye. Within the crypto/technology community, the JPM Coin is controversial because it will run on a private enterprise blockchain controlled by the bank itself, not a decentralized public platform. Bitcoin fans and other crypto purists believe cryptocurrency exists in order to wrest control away from central authorities, especially big banks and government. For them, decentralization is the essence of all things blockchain. On the other hand, enterprises in diverse verticals have been working with blockchain technology for several years, looking to centralized permissioned private blockchains for the real business value they can deliver. · Retailers such as Walmart and Starbucks. · Amazon Web Services (AWS) offers blockchain as a service (BaaS), along with IBM, HP, Microsoft, Oracle and SAP. Unlike some early blockchain startups, enterprises test blockchain technology for projects where it is uniquely qualified, not just nice to have. They are focused on real ROI. And they prioritize operations over finance. 2018 was a year of transition for crypto/blockchain. The sun set on the Wild West days of the ICO and rose on new ways to approach tokenized fundraising. Cryptocurrency took big hits in value but survived as a valid crypto asset and gained increasing use as a medium of exchange. Key blockchain infrastructure continued to be built. Enterprise proofs of concepts began moving into pilots and early production deployment across a range of use cases. Might we be moving towards crypto spring?